Harriet Beamer is a 72 year old widow who loves her church, her dog Humphrey and her salt and pepper shaker collection. After breaking her ankle and losing a bet with her daughter-in-law, Harriet feels obligated to sell her home in Pennsylvania and move in with her son in California. 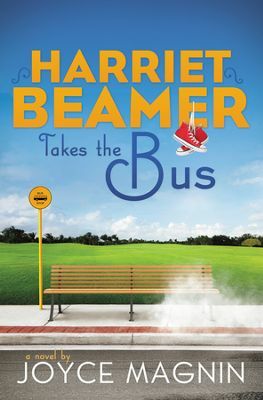 In an effort to find purpose and independence, Harriet decides to take the trip across the country in local buses – not Greyhound buses, mind you, but local buses. Along the way she finds numerous other “alternative” methods of travel. In her travels, Harriet undergoes one adventure after another, from riding in a helicopter to traveling on the Harley of a snake-handling pastor. Along the way, both Harriet and her son learn to respect the decisions the other has made for their lives. The book is a heartwarming, lighthearted and easy read. Harriet is sweet and quaint (if not a tad eccentric). All the ladies of our book club enjoyed the story. Each said she could relate to Harriet in one way or another. The book touches on themes of aging and independence, as well as our relationships with our children as adults. The book also deals peripherally with Harriet’s faith in God. Throughout the book, she showed what it means to trust in God. Sadly, however, she never spoke explicitly about Jesus or how he saved us. One topic which was discussed at length at our book club meeting was how we make decisions as Christians. The book implied that we should always follow our hearts. It was God’s will that Harriet went on her adventure because she felt in her heart she had to do it. Though our world tells us differently, to always blindly follow your heart is not wise. Our hearts sometimes can lead us astray. That being said, Harriet Beamer was a delightful read, especially for the women of our group. I would highly recommend it (especially to my mom). Have you read Harriet Beamer Takes the Bus? Leave a comment below and let us know what you thought.